Odúbel Herrera (pronounced oh-DOO-bull her-RAIR-uh)… Has one daughter, Ana Paula (9/24/15)… 2008 graduate of Unidad Educativa Estadal Juan Pedro Chourio León, where he played baseball and volleyball… Was a standout volleyball player as a prep student… Hobbies: Watching TV shows and checking various social media outlets… Signed by: Rafic Saab. T-3rd in RBI (65)... Ranked T-6th in the NL with 13 go-ahead HR... Set single-season career highs in HR (22), RBI (71), go-ahead RBI (20) and game-winning RBI (7)... Made his fourth Opening Day roster...Had an 11-game hitting streak, 4/16-28, tied for the longest by a Phillie during the season...Logged his first 2 career multi-homer games: 4/27 vs ATL and 5/7 vs SF; also collected a career-high 5 RBI, 5/7... Collected his 500th career hit and 100th career double in the same game: 5/6 at WSH...Played in his 500th career game on 6/3... Homered in a career-high 5 straight games, 6/17-22, tying a franchise record; no Phillies CF had ever homered in more than 4 straight games before him... Joined Babe Ruth (1921), Barry Bonds (2001, 2003), Jim Thome (2002) and Jim Edmonds (2004) as the only players with a 5-game HR streak and 40-game on-base streak in a single season... On 6/22 at WSH, tied a career high with 4 hits and 4 runs scored...With 7 HR in June, set a career high for a single calendar month...With his HR on 7/10 at NYM, in his 87th game of the season, set a new career high, surpassing his previous best of 15 HR in 2016...Became the first Phillie with 100 hits before the All-Star break since 2014 (Chase Utley - 104)...Became one of just two Phillies CF to have at least 15 HR and 50 RBI before the All-Star break (Willie Montanez, 16 HR and 59 RBI in 1971)...On 8/28 vs WSH, became the first player to ever homer off Max Scherzer in consecutive starts of his... Was the fastest Phillies player to reach 500 career hits (476 games) since Chase Utley in 2007 (474 games)... Was the first Phillies CF with a 20-homer season since 2007 (Aaron Rowand - 27)...Batted .288 (38-132) vs LHP, which ranked 6th among left-handed hitters in MLB (min. 135 PA). Finished 3rd in the NL in doubles (42), T-7th in bunt hits (5) and T-10th in infield hits (21)... Became the first Phillie with 40 doubles in a season since 2010 (Jayson Werth)... Played for Team Venezuela in the World Baseball Classic... Led MLB with a career-best 21-game hitting streak, 7/28-9/8 (.380, 30-79); longest by a Phillie since 2006, when Chase Utley had a 35-game hit streak... Led the team in doubles, XBH (59) and total bases (238)... Was the fastest Phillie to 30 doubles in a season (92 G), matching Jayson Werth in 2010... Made his second consecutive Opening Day start... Had three 3-hit games in an 8-game span, 6/4-11, after having none through his first 51 games of the season... Homered in a career-high 3 straight games: 7/9 vs SD and 7/14-15 at MIL... Notched a career-high-tying 4 hits (6th time), including a career-high-tying 3 XBH (4th time), 7/22 vs MIL... Hit a career-high 2 triples, 8/9 at ATL... Batted .321 (34-106), 13 2B, 3B, 2 HR, 14 RBI, .351 OBP, .519 SLG % and .870 OPS in June... His 13 doubles in June were tied for the most among all MLB players in the month (CLE's Jose Ramirez) and fell one short of the Phillies record for doubles in the month (Pinky Whitney had 14 in June of 1931)... Became the fi rst Phillie since 1900 with 12 XBH in a row (10 2B, 2 HR), 6/3-9; became the first Phillie in the modern era (since 1900) to do so and the first to collect 11 XBH over a 5-game span and have 2 doubles in 3 consecutive games (6/3-6/5)... Became the 1st Phillie since 1952 (Del Ennis) to record 3 XBH in consecutive games... Was the first ML player since 2005 (Travis Hafner) with 2 doubles and a HR in consecutive games, 6/4-5... Had an XBH in 5 straight AB (3 2B, 2 HR), 6/4-5, becoming the first Phillie to do so since June of 2006 (Ryan Howard)... Was on the 10-day DL, 8/18-9/3 (strained left hamstring) and appeared in 1 rehab game with Reading (AA) and 1 with Lehigh Valley (AAA). 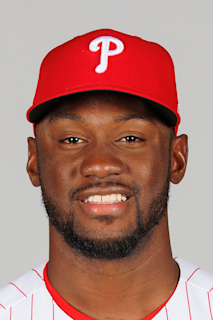 April 18, 2019 Philadelphia Phillies placed CF Odubel Herrera on the 10-day injured list. Right hamstring strain. September 4, 2017 CF Odubel Herrera assigned to Philadelphia Phillies. September 1, 2017 Philadelphia Phillies sent OF Odubel Herrera on a rehab assignment to Lehigh Valley IronPigs. August 31, 2017 Philadelphia Phillies sent CF Odubel Herrera on a rehab assignment to Reading Fightin Phils. August 18, 2017 Philadelphia Phillies placed CF Odubel Herrera on the 10-day disabled list retroactive to August 15, 2017. Strained left hamstring. December 8, 2015 OF Odubel Herrera assigned to Tiburones de La Guaira. December 11, 2014 Philadelphia Phillies drafted CF Odubel Herrera. October 9, 2014 2B Odubel Herrera assigned to Tiburones de La Guaira. May 12, 2014 2B Odubel Herrera assigned to Frisco RoughRiders from Myrtle Beach Pelicans. August 1, 2013 OF Odubel Herrera assigned to Myrtle Beach Pelicans from Frisco RoughRiders. June 30, 2013 2B Odubel Herrera assigned to Myrtle Beach Pelicans. June 27, 2013 2B Odubel Herrera assigned to Myrtle Beach Pelicans. March 28, 2013 Odubel Herrera assigned to Frisco RoughRiders from Myrtle Beach Pelicans. March 9, 2013 SS Odubel Herrera assigned to Texas Rangers. April 4, 2012 2B Odubel Herrera assigned to Texas Rangers. March 30, 2012 Odubel Herrera assigned to Myrtle Beach Pelicans from Hickory Crawdads. April 5, 2011 Odubel Herrera assigned to Hickory Crawdads from Spokane Indians. August 31, 2010 Odubel Herrera assigned to Spokane Indians from AZL Rangers. June 21, 2010 Odubel Herrera assigned to AZL Rangers. May 30, 2009 SS Odubel Herrera assigned to DSL Rangers2.